Emily and Dan’s engagement shoot fell on the most picturesque fall day, and we had the chance to capture some awesome sunset photos of them in their fall attire. There’s something about warm light on the changing leaves that is just so magical! I know, I know, we always talk about the weather, but we’re Minnesotans, what do you expect? 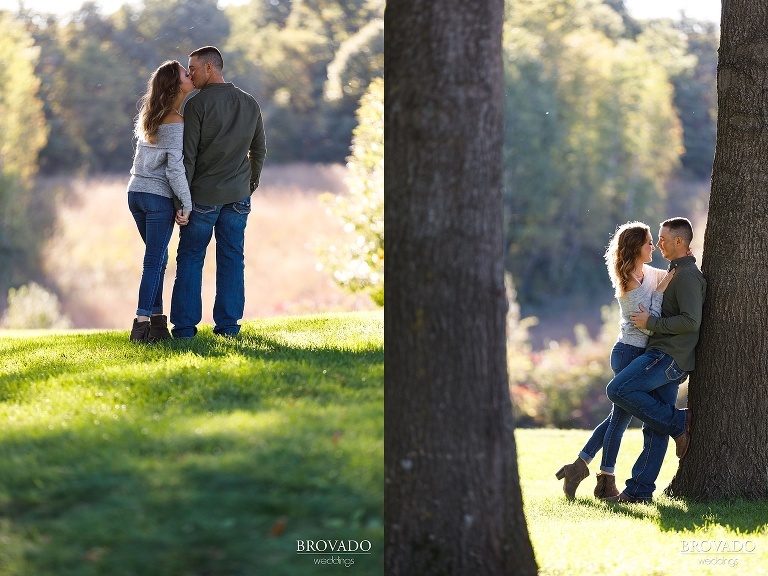 Emily and Dan are both nature lovers, so the choice to take their engagement photos at Lebanon Hills Regional Park is great reflection of these two and the time that they spend together. Dan enjoys fishing, and Emily is more than happy to tag along and fish for a bit, and then read, relax, and take in the scenery while they’re on the water. Everything is better when you’re with the trees and the one that you love! These two have so many awesome connections to Brovado, and we are beyond excited to continue to work with a group of people that we have grown to know and love! Not only was Emily a bridesmaid at Jacquelyn and Brian’s recent wedding, but she’s also sister to Anna, who had one of our all time favorite weddings in Montana. Emily and Dan, we are so looking forward to your wedding next year!